On Tuesday the 23rd, the Sun and Uranus will be on opposite sides of the Earth from one another ~ this is called an “opposition”, and it happens between them once a year. Uranus is moving through the region of Pisces stars and this is the best time of year to try to catch a glimpse of it with the naked eye, but not until after the Full Moon, which will happen the very next day on the 24th, when the Sun and Moon stand on opposite sides of the Earth from one another ~ but rather than calling this an opposition, we call it Full Moon, and it happens at least once every month. Uranus has always been associated with change, especially because it was the first planetary body to be discovered. It’s not often talked about, but the ancients didn’t just discover the naked-eye planets one day ~ Mercury, Venus, Mars, Jupiter, Saturn, they were always there, and their rhythmic presence was steady evidence of the divine. 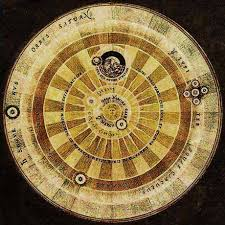 And when one of these planets was in the same region of sky with the Moon as it came to Full Phase opposite the Sun, then this held a special meaning for the ancient star gazer. So you could say Full Moon and Uranus this week herald change, the kind that results from new discovery. And that’s not all, because just as Uranus and Moon are facing off in opposition with the Sun, the planet Venus, goddess of love and beauty, slips in to company the Sun in the same degree of the zodiac ~ this is called a conjunction, and it can be imagined as a time when love and beauty are amplified by the light of the Sun. The way a storyteller of the stars might read this is to say that over the course of the next week, a growing change is underway as Moon sweeps toward Full Phase near the planet Uranus where they hold sway over the night opposite the Sun, and it’s one that needs to be met with love and grace, the signature of Venus when she joins Helios, the lord of the Sun, in the same degree of the zodiac.